The Freewheel Collective is a club dedicated to teaching people how to repair and maintain bicycles. The club also encourages people to build bikes themselves. The club president and a fifth-year Medical Scientist Training Program student, Mike Gurevich, said he’s been fixing bikes for as long as he can remember. “Fixing bikes has always been a hobby of mine as early as elementary school. I was very happy to find this club when I was an undergrad and join like-minded people,” Gurevich said. Gurevich said that the club has several regular club members who are mechanics and come to help other people who come to the shop. “We have other students and other faculty come by with other questions and so sometimes people come by because there is something wrong with their bike or they want a checkup, and we’ll help teach them how to do these things themselves so that they better understand how their bike works and they are able to fix it themselves,” Gurevich said. The club also has a “bike grant” program, where they take in abandoned bikes. The University Police Department will donate abandoned bikes that haven’t been claimed, which the club will let other people fix and use as their own. “This is like a recycling thing,” Suyash Bire, a graduate student and mechanic in the club, said. The club organizes events as well — according to its website, the collective “encourages and celebrates bike riding as an ecologically and economically sound form of transportation.” There are no dedicated club events scheduled currently. 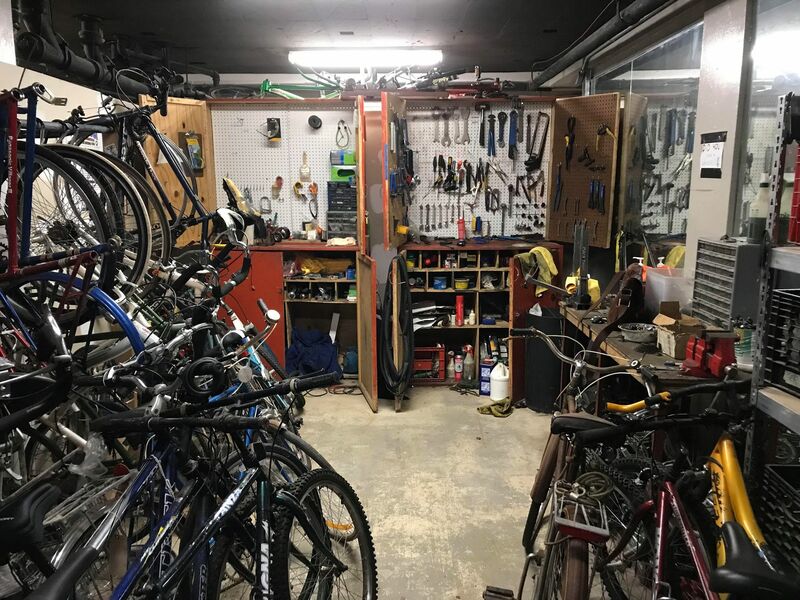 Yousuf Nayeem, a junior sociology major who has been in the club since last semester, said that he had a great experience working in the shop and learned a lot about repairing bikes. The amount of people who come to the shop varies throughout the semester. Bire said that they might see about 10 or 15 regular attendees early in the fall and late in the spring semesters, but only one or two during the winter months. Gurevich encouraged all students who own bikes to check out the club. “I would argue that a basic understanding of bicycle function and maintenance is important for being able to inspect your own bike for safety before and during each ride,” he said.